The U.S. Department of Agriculture is reconsidering approval of Monsanto’s genetically modified “Roundup Resistant” alfalfa for sale in the US. 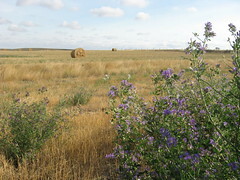 Environmental groups and conventional seed companies sued the USDA in February 2006, forcing it to rescind its 2005 approval of the Monsanto alfalfa seed until it did a full environmental study. One of the biggest impacts of allowing the use of genetically modified alfalfa is contamination of other crops, including organic alfalfa, which is used by most organic dairies and organic grass fed beef producers. In its own report, the USDA acknowledges the problem with contamination but says that consumers may not care enough about it for the USDA to block Monsanto’s modified alfalfa seeds. This is absurd since one of the main reasons people buy organic food is to avoid genetically engineered crops. Approval of Monsanto’s products in the US will have effects worldwide. The spread of modified genes by natural pollination is inevitable. The USDA is accepting public comments for the next two weeks. Please take a brief moment to sign the petition below requesting that the USDA not approve Monsanto alfalfa.